Can you feel it???? Excitement is in the air as we put the final touches on the 2019 Athens Eggfest next weekend. 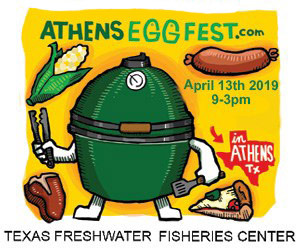 We’re proud of our Eggfest in that all proceeds raised from the event go to the Friends of the Texas Freshwater Fisheries Center to support their educational outreach programs and we couldn’t be more pleased that you have chosen to join us as a Cook for the event! Trust me, I know that’s no small feat! Between the expenses of travel, lodging, and food, it’s a lot. THANK YOU for choosing our Eggfest at which to cook! Now to the nitty gritty . . . Cooking teams can begin checking in after 3:00 p.m. on Friday, April 13th. Simply enter the Texas Freshwater Fisheries Center from the back entry gate off of Peninsula Point and head to the Hart-Morris Conservation Center (where the catering kitchen is). There will be a staff member to greet you and provide you with a goodie bag and name badges. A BIG thanks to Paragon Distributing for providing the goodie bags and contents! Each bag will have two $25 gift cards ($50 total) to Brookshire’s to help you with your cooking ingredient needs. These card are compliments of Paragon Distributing and Brookshire’s. THANK YOU SO MUCH, sponsors! This is always a welcomed treat for our cooks!! Paragon Distributing and 407 BBQ our hosts that evening for a Welcoming Reception/Dinner to be held at the Texas Freshwater Fisheries Center.Y’all be enjoying a terrific barbecue meal compliments of 407BBQ in Argyle, Texas. Barbecue and all the trimmings will be served along with beer, wine, soft drinks, tea, and water (Drinks compliments of First State Bank and Steve Grant Real Estate). This event is open ONLY to our cooks and cooking teams, as well as our sponsors. It’s a fun time to meet and greet, and also provides a time for cooks to scope out their cooking stations for the event. PLEASE NOTE: With the exception of First State Bank and Oakwood Place, each cooking team will have access to ONE Large Big Green Egg. Special requests for additional Eggs or Eggs of different sizes will be accommodated IF POSSIBLE. This is all contingent on the number and size of Demo Eggs committed. Your understanding of this is greatly appreciated! On Saturday morning, please plan on arriving at TFFC between 7:30 a.m. and 8:30 a.m. We ask this so that your station can be completely set up before the facility opens to the public at 9:00 a.m. In the past, we’ve had a few late arrivals and it’s rather awkward. Your help in this is greatly appreciated!! Feel free to decorate your station to make it even more inviting to visit. Possibly consider having a sign that tells what you will be preparing during the day and the times that you expect to serve. This has been handy in the past. Of course – it’s entirely up to you! You will have complete access to the catering kitchen and there are restrooms in the Conservation Center as well. Space in the refrigerator/freezer is first-come, first-served. We will also have a table in near the catering kitchen that offers forks, spoons, plates, serving cups, napkins, etc. for our cooks to use at their stations. Please remember that these supplies are for all of our cooks and don’t be greedy! Light your charcoal as soon as possible to help you get a jump on the day. In the past, we’ve had cooks that come prepared to make breakfast items between 8:00 a.m. – 10:30 a.m. and these are ALWAYS well received. As the crowds arrive, no doubt they’ll LOVE what you’re serving and possibly ask for the recipe. Please consider having copies of your recipes handy should this happen. I will also post all available recipes on our website following the event. Just a heads up. This year, our newest sponsor (Steve Grant Real Estate, LLC) is giving away a Large Big Green Egg setup from individuals that have signed up via Facebook. This drawing will take place at noon and may effect the number of people milling around during the lunch hour. If you haven’t already seen the contest announcement and entered/shared it, please visit Steve Grant Real Estate’s Facebook page and check it out! We really want to get the word out about the event to as many people as possible so PLEASE share it with your friends!!! Paragon Distributing has once again donated a Large BGE setup for our raffle. Raffle tickets will be $10/each and the drawing for that BGE will be at 3:30 p.m. Please begin winding down for the day around 3:00 p.m. – 3:30 p.m. This will allow our Demo Eggs to completely cool before they are loaded up to go to their new homes. By this time, everyone is typically exhausted, and for good reason! All cooks who would like to wind down and visit about the day are invited to attend an After Party in the Conservation Center, beginning at 6:00 p.m. that evening. This is a potluck dinner where our cooks often make special “treats” to serve to their friends. Drinks will be provided.